Mackerel time - time is all important. 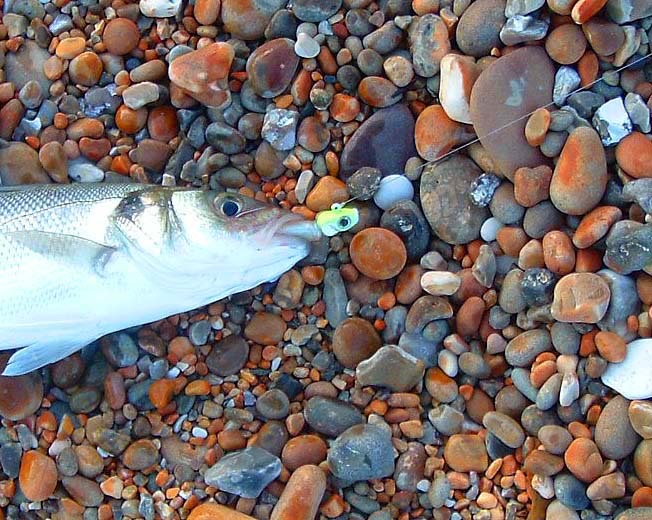 I decided that I did not particularly want to catch mackerel and would try to select for any bass that were about. 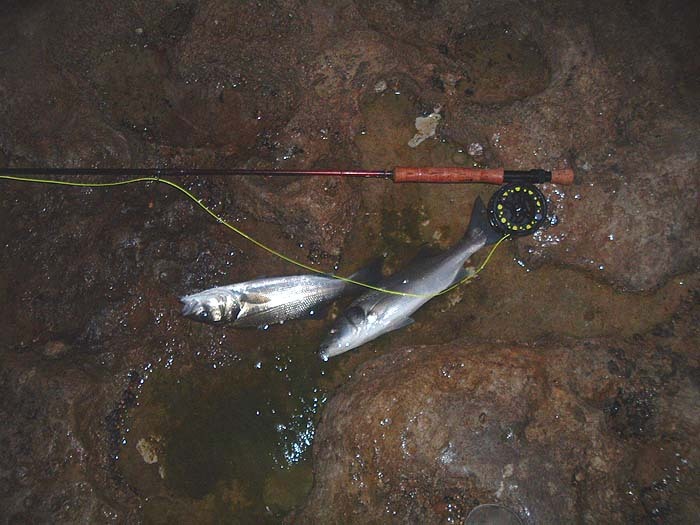 To do this I tied on a big surface popping lure. 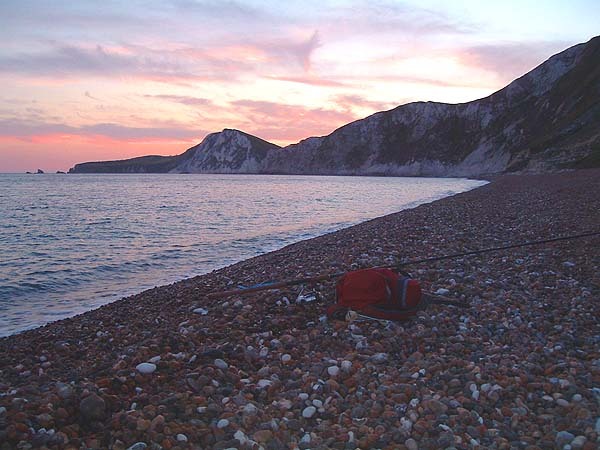 I started at the near end of the beach and trudged slowly along casting every few paces. For fifteen minutes - nothing! Then I came to a short stretch where the water was slightly milky with suspended chalk. At the very end of my retrieve, literally just as I was lifting the lure from the water and no more than half-a-metre from the edge, a fish grabbed it. It was only a small bass but since that's what I was after I was well pleased. I continued on and fifty metres further along the beach the water was clear again. I reached the far end of the bay and no more bites were forthcoming so I decided to change the lure and work my way back. I tied on a white rubbe lure with a leadhead that I'd never used before. 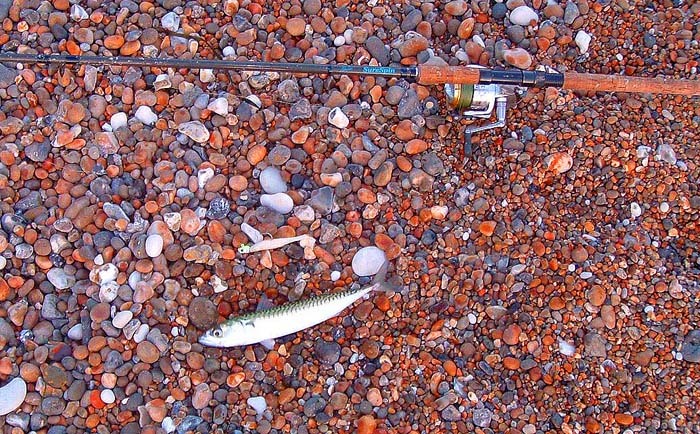 Nothing happened 'til I reached the chalky stretch then I hooked a mackerel. This was followed by a pollack then three more bass and another three pollack. I fished back as far as the path but there were no more bites. 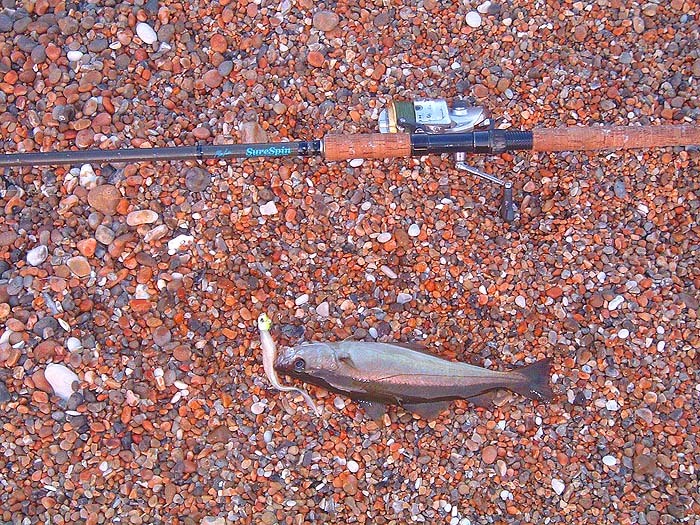 Still I had caught a fair proportion of bass and managed to avoid most of the mackerel. 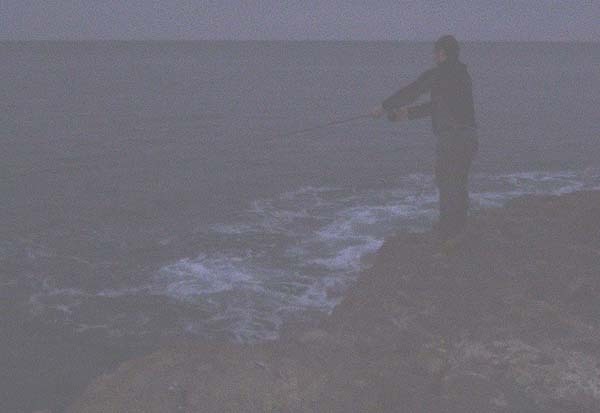 A couple of days later I arranged for an early morning session from the rocks with my pal Ben. We arrived bright (well actually pretty gloomy at 04.00h) and early with both fly rods and spinning rods. I was continuing last year's experiments with a cast of two tiny rubber eels - one black and one white. Ben was using a Clouser minnow type fly. It was probably fifteen minutes before either of us had a bite on the fly gear then we began to catch pollack and mackerel fairly regularly. In fact I was standing a few metres to Ben's left and was getting rather more bites than my mate. I suggested that we swapped stances for a while and holding my rod high, began to walk past him. We had no sooner crossed over than my flies, which were still trailing in the water, were taken and the reel began to scream. 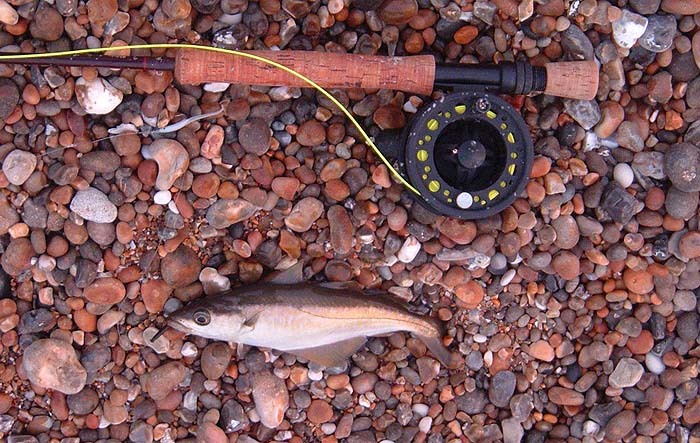 The fish went berserk rushing off lots of line against the clutch on my fly reel. When I eventually had the fish under control it turned out that I'd hooked not one but two modest bass, one on the black 'fly' and one on the white. No wonder it pulled hard. Later in the week I went down again with Steve Pitts and we had lots more mackerel and pollack (no sign of bass this time) including four pollack double headers on my two flies. Again there was nothing doing for the first ten or fifteen minutes then, as the light improved, the fish fed for perhaps three-quarters-of-an-hour before they went off again. Timing can be everything when it comes to catching fish. 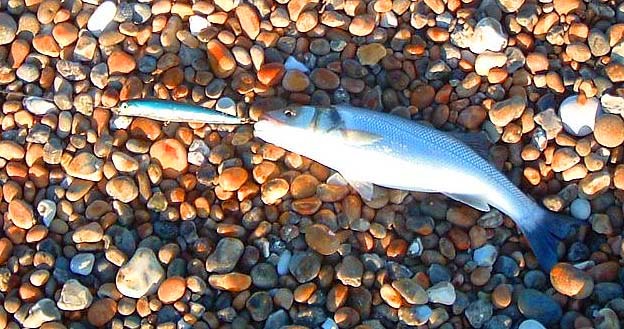 Mackerel on a rubber lure.